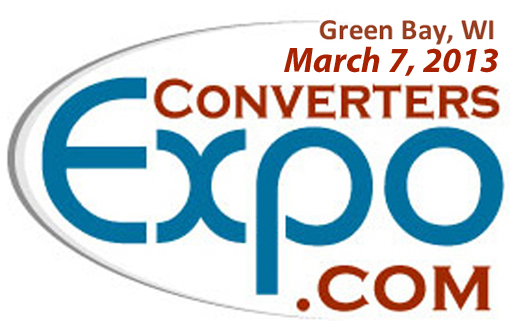 Now in its sixth year, Converters Expo is ready to spotlight the raw materials, machinery suppliers and contract converters that together make up “The Converting Corridor”–the industry’s manufacturing base running north from Chicago to Milwaukee to the Fox Valley and Green Bay, WI. The intensive, one-day event will be held March 7 at Lambeau Stadium–home of the Green Bay Packers. About 100 exhibitors will be on hand, displaying paper, film and nonwovens materials; rewinding & sheeting equipment; coater/laminators & adhesives; flexographic printing presses, inks and plates; testing, product development and contract-converting services; and automation & machinery components/accessories. A full exhibitors list is available HERE. Registration fee is $40 (includes lunch). SkyBox Seminars (90-min each) will be offered during the tradeshow. Topics include “Latest in Flexo Printing with Comparison to Digital Printing” 9:00-10:30 a.m.; and “Industry Outlook & How to Build Value” 10:30 a.m.-Noon. The seminars are limited to 20 people each, priced at $100 for one, or $150 to attend two. American Custom Converting, Green Bay. www.ACConverting.com. Contact Mark Kyles or Mike Paschen, 920-494-3258. Slitting-winding-adhesive laminations-folding. ASPIRO, Green Bay. www.AspiroInc.org. Contact Paul Cantwell, 920-593-4370. Contract manufacturing, sewing, sorting, collating, assembly, packaging. Baum Machine, Appleton, WI. www.BaumMachine.com. Contact Dan LaFond, 920-470-0546. Horizontal/vertical machining, turning-roll capabilities, custom machine design, fabrication, assembly. STEP Industries, Neenah. www.StepIndustries.com. Contact Cheryl Fritz, 920-585-4765. Contract assembly and packaging services…creating productivity solutions. Top Brass Inc., one hour west of Green Bay. www.TopBrassInc.com. Contact Brad McKay, 715-253-2750. Wet-wipe manufacturer and contract-packaging expert, working with both stock products (Private Labeling) and custom solutions (Contract Packaging). And don’t forget to stop by CONVERTING QUARTERLY in Booth A-302. We’ll have copies of our 2013 Quarter 1 issue as well as the new CQ Buyers Guide. This entry was posted in coating/laminating, flexible packaging, labels, package printing, paper/paperboard/cartons, slitting/rewinding and tagged appleton wi, boxes, business, cartons, converting, corrugated, flexible packaging, flexography, green bay packers, labels, packaging, paper, paperboard packaging, plastic film, printing, sheeting equipment, technology, tissue/towel. Bookmark the permalink.